In today's world, the Spartan is well designed for field dressing game. The 4-1/2-inch blade's point is shaped for penetrating, and the deep belly of the knife aids in shallow skinning cuts or deeper butchering cuts. The recurved plain edged blade of AUS8A high carbon stainless steel draws the knife deeper into anything that passes over it, including rope and straps. 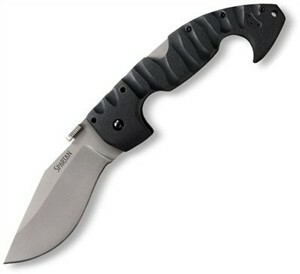 If you don't like the feel of G-10, you'll appreciate the hard ribbed Grivory of the Spartan's handle. Grivory often substitutes for metal in the automotive industry with the feel of iron or steel but not the weight. By shape alone, this unusual knife stays firmly in hand. Stainless steel liners beneath the six-inch Grivory handle slabs add even more strength. The Spartan's Tri-ad blade lock is equally tough and clearly able to survive more punishment than the average user deals out. Technically, the 7-1/2-ounce Spartan is a one-hand opener, using a thumb plate on the back of the blade as a leverage point. Action of the knife typically is stiff, especially when new. That limbers up with use, but one-hand opening may not be as reliable as the two-handed method. Cold Steel suggests hooking the thumb plate on the lip of the pants pocket and opening the blade that way. Owners are confirming that this isn't as simple as it sounds. Combine that with the extra stiffness of the stainless steel pocket clip, and there's some heavy wear and tear on pants. You wouldn't notice the link to Greek history unless someone explained it, and there are a few quirks -- but if you like large folders you'll like the Spartan. See the Cold Steel Espada for an even larger folding knife inspired by ancient weaponry.